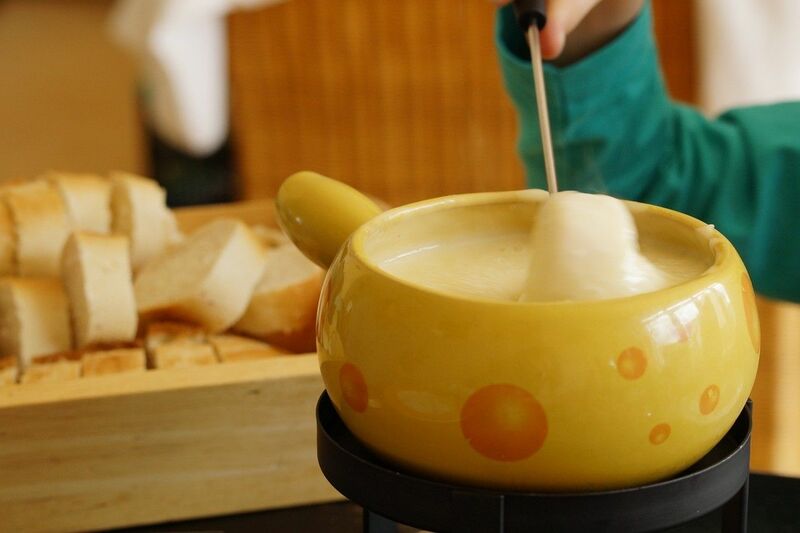 A meal where people has fun trying out different tastes, where the host remains with the guests throughout the evening and everyone enjoys themselves: voila, a fondue night. There’s nothing more welcoming. Although it doesn’t take much, there are still certain rules to follow so that everything moves as smoothly as possible. Proper utensils are a must and you should first and foremost have fondue pots suited to the type of fondue to be served. Ceramic or enamelled cast iron are required for cheese fondue. A large selection is available for oil fondue (bourguignonne) and Chinese fondue. A small fondue pot is sufficient for chocolate fondue. But the most important part is the burner, except in the case of chocolate fondue, for which a single candle is enough, as here it’s only a question of keeping the chocolate at the right temperature. It’s important to check that the apparatus is stable and will remain steady on the table. Make sure you have enough fondue forks and lots of paper napkins to go around. Try out the burner before the meal and make sure you have enough fuel. Light the stove ten minutes before the meal starts, to avoid doing so in front of the guests. Prepare all the necessary items (sauces, vegetables, fruits, condiments, etc.) and set them out on the table before bringing in the fondue. It’s important to offer a nice variety.